The gap between material science and actual construction is very far and very wide. It can take decades to move a breakthrough in engineering from a lab to a building site. But as architects and engineers face bigger challenges—from earthquakes to dwindling resources to sheer cost—a new generation of smart materials is emerging. Over the past month, a number of fascinating studies have crossed our desks, some of which are still quite far from a reality outside the lab. Still, these project show us where building science is heading, and how, in months or years or even decades, our buildings might act. It's a trope you've seen in heist movies: The team's computer expert can pull up a model of any building and tell when it's been compromised... Somehow. A team from North Carolina State University and the University of Eastern Finland are actually developing a practical version of this classic cliche, using conductive paint. In a study published in June, the researchers explained how the system works: First, electrodes are placed around the skin of the building. Then, the conductive paint is layered over them. After that, a current is run through the electrodes in different combinations, and a complicated algorithm can determine whether the electrical potential has changed—if it has, the system can work out where. This kind of paint could be invaluable for older buildings, or those in earthquake zones. Or, as Global Construction Review points out, it could be used to monitor any structural fissures at nuclear power plants. One major deterrent to the height of supertall buildings is elevator technology—at a certain height, the amount of steel rope needed to pull people upwards becomes too heavy and the number of separate elevators needed to reach the top skyrockets. Kone, a Finnish company Gizmodo has written about before, has developed an alternative: A rope made of carbon fiber that's 90 percent lighter and could support elevators up to twice as high as the current limit. It's called UltraRope, and it could enable elevators that are up to a kilometer in height. It'll also change how elevators are serviced, since it will last twice as long than standard steel rope. Mechanoluminescence is a phenomenon in which a particular material will light up when it's put under some form of physical stress. 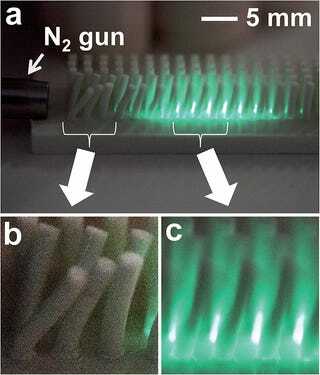 In the case of this material, a team from South Korea's Daegu Gyeongbuk Institute of Science and Technology infused plastic with, according to PhysOrg, "colored phosphors made out of copper-doped zinc sulfide." For non-chemists, the combo results in a white light when put under mechanical stress. In order to take advantage of wind energy, the researchers molded the plastic into tubes—when the wind blows, the tubes deflect and the light appears. It's easy to imagine how such a material, though still far from a reality outside the lab, could change our built world. Imagine facades that light up in the wind, or beacons that glow to broadcast information about weather conditions. If you've ever sat inside a room that has photovoltaic panels on the windows, you know it's easy to recognize the tell-tale, shimmering rainbow color of the cells. Researchers at Michigan State have developed an entirely different type of "solar concentrator" that can be layered over any window. The stuff takes advantage of non-visible wavelengths of light—ultraviolet and the near infrared—pushing them to the solar cells embedded at the edges of the panels. The result is a material that can make energy from sunlight in any number of practical situations—for example, in the screens of gadgets—but also in windows and doors. Bamboo is inexpensive, it grows fast, and it's surprisingly strong. Which is why a team at MIT is studying how to get "more bang for your buck" when it comes to using it in construction. Led by professor Lorna Gibson, the project is testing how and why bamboo is so structurally advanced. They've found that the material at the edges of a bamboo rod is actually denser and stronger than the stuff in the middle—and they envision using it to create a secondary building material, like plywood, to make houses and buildings that are stronger, cheaper, and less environmentally impactful. 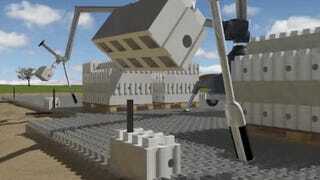 Besides their obvious fun quotient, Lego are a pretty brilliant solution to prefabricated architecture. Not only do they snap together quickly and leave zero extraneous waste, the holes could provide extra space for wiring, plumbing, and even structural reinforcement. That's why a company called Kite Bricks wants to use Lego as a basis for a real-world building material called Smart Bricks. Just like the toy, these concrete-molded bricks "snap" together with a layer of mortar-like adhesive, but the "holes" can actually be threaded with rebar for extra structural reinforcement. And one side of each brick can be removed so that you can access the services stored inside. The company is still finishing raising the capital to actually produce them—and who knows how Lego feels about the idea—but it's fascinating project. We know that sound can transmit energy, but a new company called uBeam wants to turn that technology into a building product. Here's how it works: A transmitter takes electricity and turns it into ultrasonic sound. A receiver on your wireless device captures that audio and turns it back into energy. You'd be able to charge any device while walking around your home. Right now, uBeam is focusing on putting its technology in wallpaper or a piece of art, but it's easy to imagine how eventually, these transmitters could be embedded in all sorts of materials and places—an ambient web of ultrasonic sound that networks entire buildings.